Providence often takes a hand in the world of collecting vintage fishing tackle and flydressing materials. More often that not, valuable collections are split up, and dispersed around the four corners of the globe, without ever coming to form the complete assembly in their entirety. Angling collections, and in particular flytying collections, become scattered fragmentary relics of a sport that is now in a sad decline. Often, items are bid upon, won and lost, in various auction formats, without ever being married up to once again form the original intended collection. Happily, however. In this case, providence did take a hand. After searching through some of my north country collection, I realised I had the same man’s vintage leather fly wallet, which I had bought some years previous. The fly wallet was marked with the unmistakable name of J. Hubie Pilkington, with the address Catterall House, Nr Garstang, scrubbed out and replaced with his business address of 16 Lord Street, Preston. 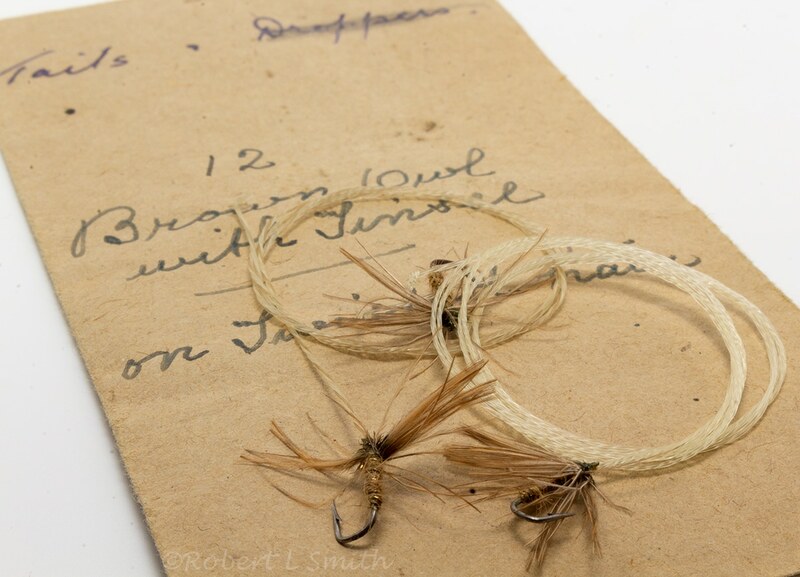 Both addresses were also found within the many items of correspondence within the later purchased flytying collection. It was obvious that both auction lots, bought at different times and from different sources, belonged to the same person. And bringing both auction lots together, in some way has brought Mr John Hubie Pilkington’s and his son’s Thomas’ passion for angling back to life once more. And thanks to a well-known ancestry related website, I was able to contact a descendant of the Pilkingtons, and build a more complete portrait of both men, their families and sporting lives. 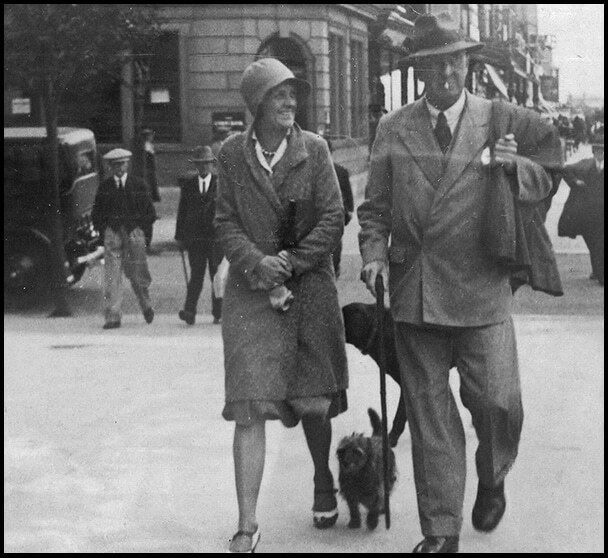 Born in the Yorkshire town of Goole on the 2nd of February 1868, to parents Richard and Isabella Pilkington (Nee. Crabtree). John Hubie Pilkington was already an iron merchant based in Preston, when he came into further wealth and ownership of T.C. Holden – Iron and Steel Merchants, through the death of Thomas Chaffer Holden, his uncle by marriage. With no children of his own, T.C. Holden’s wealth was distributed amongst the three sons of his wife’s sister. With future Pilkington offspring carrying the name “Holden” in tribute to their distant and benevolent relation. 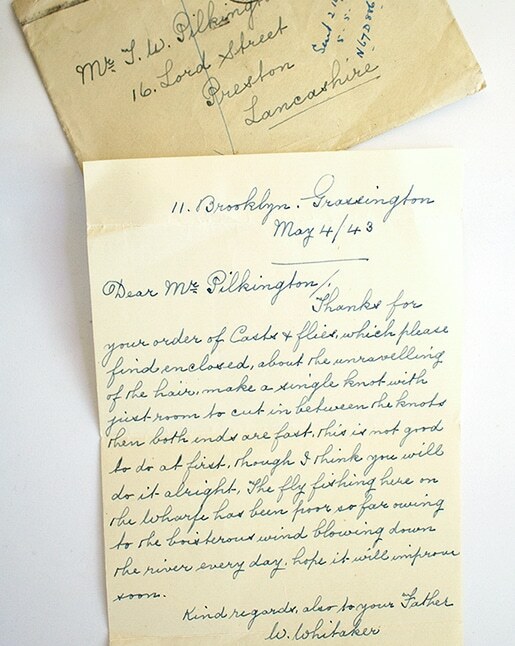 Following correspondence with the remaining members of the Pilkington family it seems that “Hubie”, as he was more commonly known to his friends, was more interested in the life of an Edwardian “gentleman”, rather than the day to day management of the family business. Frequently hosting grouse shooting parties at Shap and spending much of his time fishing the many rivers of Yorkshire and Lancashire, including the rivers Brock and Wyre, near the family home of Catterall House, Garstang. Later John Hubie Pilkington would move his household which included his divorced daughter Muriel, two maids and a cook, to the new family home at Orchard House, Lytham St. Annes. And it is here that he died on 19th April 1944. How his fly wallet and flytying collection made it to auction in East Sussex and Somerset is somewhat of a mystery. But thankfully, after a couple of winning bids these two precious objects made their way into my own collection. Giving me, not only the opportunity to trace their ancestry. But more importantly, to research some of the individual flies and tying materials found within both the fly wallet and the flytying box. With many items having a provenance linked to some of the North Country’s finest flydressers and fishermen. To further prove that providence often takes a hand in the purchase of flyfishing collections. I originally sought to buy the John Hubie Pilkington’s fly wallet simply because it came with a small selection of flytying materials, amongst which was a small envelope marked water-rat fur, a dubbing material which is now almost impossible to find. Sadly, the envelope contained no trace of any water-rat, but my disappointment was immediately dispelled when the full contents of the fly wallet became obvious. Immediately upon opening the wallet’s buckle, it became obvious that this rare find wasn’t just any run of the mill fly wallet. But a huge personal collection of fly patterns dressed on horsehair droppers and tails. Traditional north country spider patterns dressed by some of Yorkshire’s finest and most well-known Edwardian flydressers. All in perfect condition, and still contained within their original supplier’s envelopes. Imagine my euphoria, when contained within the wallet’s first velum compartments, were an immaculate selection of north country spiders, on single and twisted hair droppers, and dressed by the celebrated Nat Hunt of Horton-in-Ribblesdale. Hunt was the long-serving river-keeper to the Manchester Anglers Association, who’s beats comprise of many miles of the river Ribble. Mentioned by both Richard Clapham in his 1947 publication Trout Fishing on Hill Streams, and also Lieut.-Col. William Keith Rollo in his 1924 publication Fly Fishing in Northern Streams, as one of the best suppliers of traditional horsehair casts. 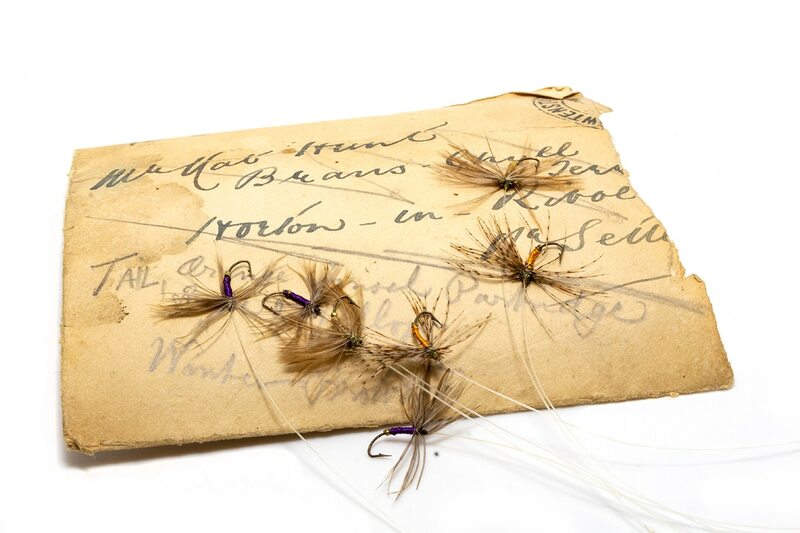 Nat Hunt was a superb flydresser of north country spiders, and his traditional patterns were much sought after by a generation of anglers from far and wide. As a one-time member of the Manchester Anglers Association myself, it was great to finally unearth several signed envelopes of Nat’s flies, and give testament to Clapham and Rollo’s earlier statements about the quality of Hunt’s horsehair fly casts. Later, whilst rummaging further through the velum pockets stuffed with both opened and unopened envelopes of flies, I can across a selection of Light Needle’s dressed on hair by Willie Whitaker of Grassington. The grandson of James Whitaker, the distinguished river-keeper on the Bolton Abbey estate waters of the River Wharfe, and a founding member of the Burnsall Angling Club. Willie Whitaker was like his grandfather a renowned flydresser and supplied his beautifully dressed spider patterns to a number of local angling tackle dealers, including Walbran’s of Leeds. He was the “local expert” mentioned in Edmonds & Lee’s Brook and River Trouting and was also featured in Herbert Palmer’s 1933 publication The Roving Angler. 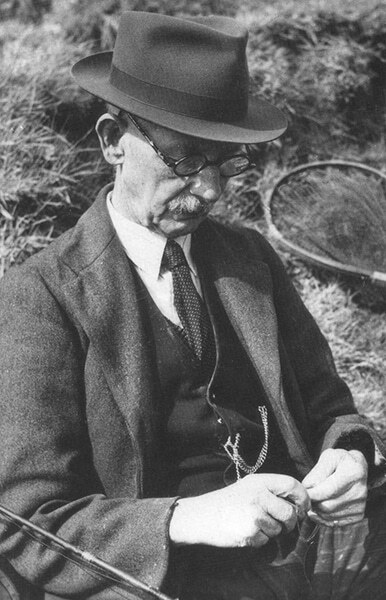 Whitaker’s flies were the perfect images of everything I had read about his exceptional tying skills. Immaculately dressed on twisted and single hair droppers, it is at once clear that Whitaker was expertly schooled in a long tradition of north country flytying. Nearly a century old, his flies easily surpass many of today’s professed “expert” spider-men. With over 500 immaculately dressed spiders on a range of horsehair casts, droppers and tails. I started the process of cataloguing the multitude of flies contained within the wallet. Individual packets of previously opened flies were carefully examined, and their contents catalogued. Flydressers names were identified and fly patterns were cross-checked against my own ever-growing spreadsheet of manuscripts, flydressers and patterns. Later, with the benefit of the Pilkington flytying collection, and their correspondence with the various flydressers of the time. I was able to accurately build up a picture of the wallet’s contents, and finally piece together the origins of many of its contents. As my researching came to fruition it became clear that it not only contained patterns dressed by such notables as Hunt and Whitaker. The wallet also held a smattering of patterns dressed by the famous flydressers Thomas Chippendale of Otley, and Jim Blades, son of the great James Blades of Hawes. 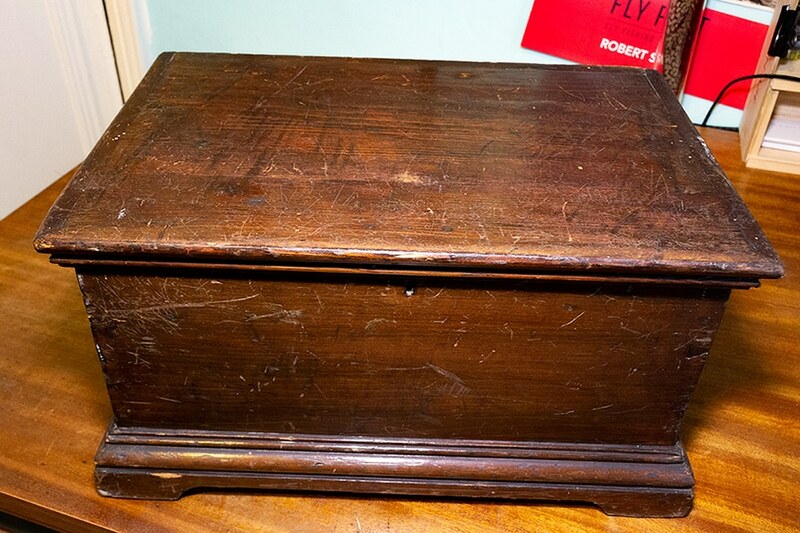 Upon the death of John Hubie Pilkington in 1944, the fly wallet, a treasure trove of North Country flies, was passed down to his son John Worsley Pilkington. He not only maintained this valuable collection, but also added his own personally dressed patterns into the flyleaves, with many now dressed on modern nylon casts. Born in Burnley on 31st December 1892. Thomas Worsley Pilkington inherited not only his passion for angling from his father, but also an appetite for tying the traditional north country patterns. For any collector of items related to the tying and fishing of traditional north country spider patterns, Thomas Pilkington’s flytying collection is a unique and prodigious find. At the heart of his collection is a hitherto unseen assortment of north country fly manuscripts. It includes a handmade materials book, comprising of numerous pages carefully folded to form individual material pockets. These pockets hold a variety of typically rare flytying materials dedicated to the dressing of traditional north country flies. Including materials such as Cuckoo, Dotterel, Grey and Golden Plover, Kestrel, Lapwing (Peewit), Merlin (Blue Hawk), Swift (Screamer) and many more other capes, feathers and wings. 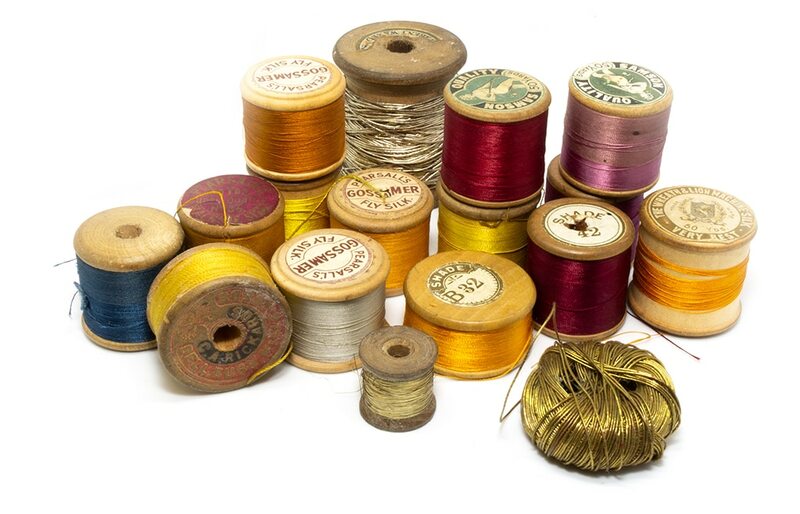 A vast selection of silk threads is also contained, along with several packets of vintage hooks and old tying tools. Like his fathers’ fly wallet, Thomas’ flytying collection features numerous packets of traditional flies dressed by some of the north country’s finest flydressers and anglers. The flies of James Blades, William Brumfitt, Thomas Chippendale, Maskell Mitchell and Willie Whitaker, are all represented in their signed individual envelopes and small packets. And there are many letters of correspondence between Thomas Pilkington and many of these famous flydressers of the day. Including several letters of instruction by Willie Whitaker on how to successfully attach dropper flies to horsehair casts and also Nat Hunt’s personal instructions on how to dress north country spiders. 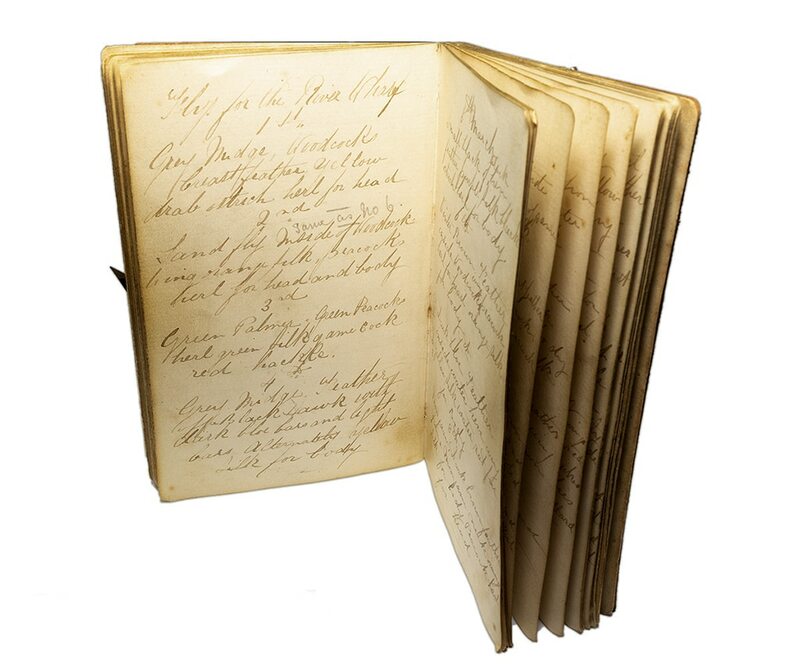 Thomas Pilkington’s angling club memberships is also in evidence, with many letters from some of the north’s most exclusive angling clubs and associations present in the collection. Including several memberships cards from the Manchester Anglers Association amongst others. However, it is a small brown notebook of fly patterns that is the real treasure of this collection. This notebook has several lists of fly patterns in different handwriting and appears to have been started around the late-ninetieth century. The first source of patterns is from James Whitaker, the famed 19th century Bolton Abbey river-keeper, and the book contains a full list of Whitaker’s flies for trout and grayling. Another source of flies contained within the book is from an as yet unknown list of Wharfedale flies and contains numerous hitherto unknown patterns. 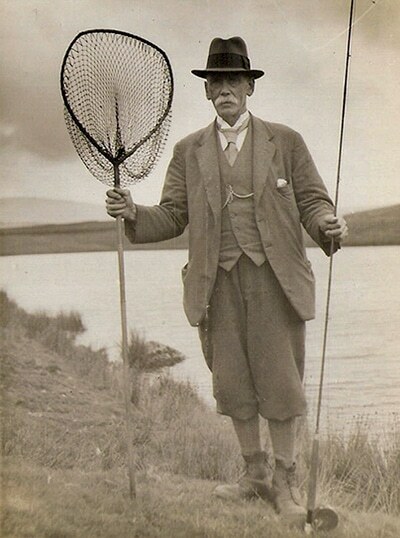 The third and last source of flies come from the famous Manchester Anglers Association river-keeper Nat Hunt. 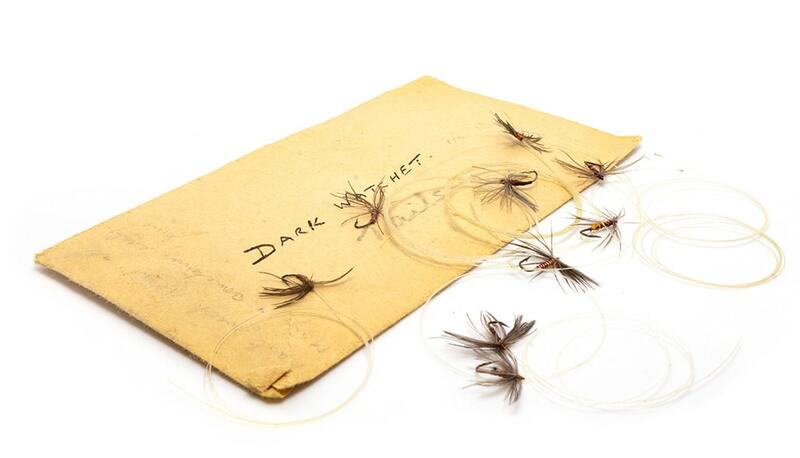 Here in his distinctive handwriting Hunt details dressings for a range of trout and salmon flies, including a healthy list of tradition north country spider patterns. As a seasoned collector and devotee of all things related to the tying and fishing of north country spiders. I am blessed that providence took a hand in the purchase of the Pilkington flytying collection. It is a treasure-trove of patterns, materials and manuscripts. And shows not only the Pilkington family’s knowledge and skill in tying and fishing the traditional north country flies. But serves as an inspiration to this modern scholar of the north country tradition.